I truly understand what the person is going through, a co worker and I are experiencing the affects of bullying. I talked with a counselor before I could put a name to what was happening. I felt violated whenever in the presence of the person, but couldn't really put my finger on the problem. The person invades my space, does not respect my personal boundaries or anyone's. Always has to have control, is always right. Screams, stares, isolates. 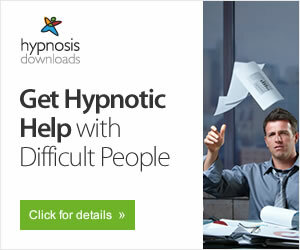 She is truly using psychological warfare. I just filed a complaint through management and have been separated from the bully, we are waiting to see what happens. I do worry for my safety and my property. How well I know about how a psychopath bully invades space and steals from me. He also quickly takes things out of context, and the slightest "wrong move" causes violent outbursts. One bully I know is very musical and seems to be ultra sensitive to sound, even the spoken word. I have learned to remain silent most of the time I am around him, smile, shake my head yes and never make a contribution to the conversation. He is so self absorbed he hasn't even noticed that I am not conversing. I also observe that most bullies seem to be damaged by the world they were born into... chemicals in the food, toxins in the environment, pregnant moms who used drugs and other substances -- the list goes on and on. They have no conscience, no respect of self or of others. Sadly, until we build a green, healthy society, I do not believe we can eradicate bullying. Bullies enjoy making others miserable because they're miserable themselves. Environmental toxins are everywhere, and yet everyone is not a bully. In fact, the majority of people are not bullies. Women normally banter with words, looks and attitudes rather than fists. Men usually stop a bully by fighting back physically or appearing to be a threat. Women have to be clever with words and quick. Women have to appear to be a threat too, in order to stop the bullying or slow it down. Women need to be assertive. Most of us were taught not to be assertive, so we suffer quietly while we're being abused by bullies. A bully hates it when you fight back and make it not worth their while to bully you. If every time a bully attacks you, they get stung by you, after a while they'll learn not to attack anymore. A woman can fight back by being firm and strong, not backing down, not appologizing and not being an easy target. Be brave, next time this person comes to bully you, say, "Oh get out of here and leave me alone." Really mean it. Talk at a normal level in your workplace; and do whatever you want and quit letting them run your life! They enjoy it, and you're suffering. Turn it around somehow. There are plenty of appropriate ways to be assertive and stop them short. When they bug you, bug them back in a way that gets to them. Life is short. You don't deserve to suffer like this. Look for a crack in their armor. It seems that once one is "targeted" by another, intent on causing pain, for whatever reason the bully may have for their abusive behavior patterns, the target is forced to respond, or not respond, in one way or another, despite the fact that the target never asked for or deserves the bullying abuse. 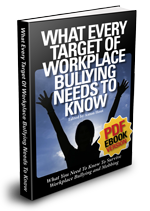 What will it take to change the pattern of current workplace bullying, so that even the smallest infraction by anyone impinging on, or abusing someone else, is dealt the full measure of and punishment for, their unwanted and unwarranted behavior? In order to eradicate bullying from the workplace, bullies must be publically exposed and held accountable. Like the Civil Rights movement, in order to change reality, we must change our perceptions, and changing perceptions, is probably the most difficult challenge. Most people resist change, why? Because it requires thinking and work. Most targets represent change, different attitudes, different thinking, different ideas, and bullies regard difference as a personal threat. Targets are considered a threat to the bullies existence, and therefore must be eliminated. Bullies operate on a very simple behavioral level, they see everything through their subjective lens as either that which doesn't threaten them, and that which does. Whether the threat is real or not is unimportant, the bully's world view is black and white, literally and figuratively. Bullies are not concerned with how another "feels" they are only concerned and consumed with their own feelings, and the normal rules for interpersonal relationships, don't apply. Bullies cannot empathize, and don't understand human compassion, they have some type of psychological filter that prevents them from sensing others feelings. What they sense is their own feelings, so when they take some type of action on a target, they sense that the action they took gives them some type of satisfaction, so they continue with their learned behavior patterns, so using/abusing others is a way that reinforces their behavior. It's like an electrical shock to their brain, so they are always trying to turn on the switch that gives them stimulation. Most people reflect before reacting, bullies react, they do not reflect. Bullies imitate their surroundings. Their existence is not of ideas, but of consuming.